The devastation surrounding California right now has taken a toll on everyone, leaving families with nothing and nowhere to go. Over the past few weeks, forty-two people are dead, and hundreds continue to go missing, thousands are homeless. As the Campfire is slowly maintained, the devastation is starting to show. 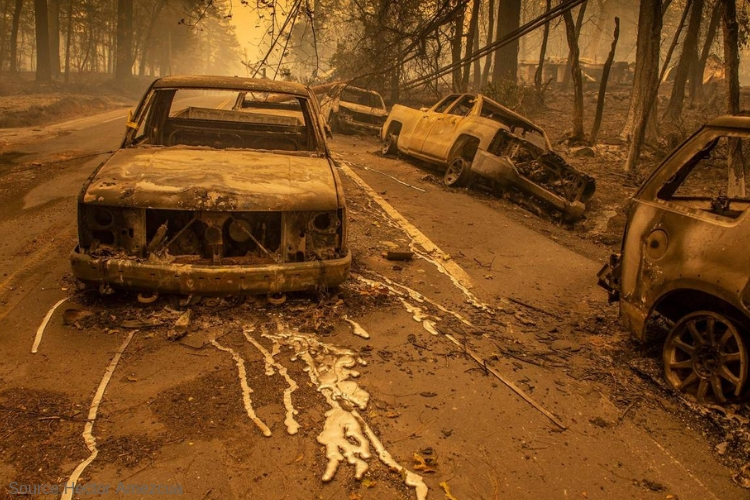 The Camp Fire has been given the title of the deadliest and most destructive in California history, police warn others that more deaths are likely as 13 search crews dig through ash and cinder looking for remains. The fire has claimed more than 125,000 acres with only 35% containment, growing 8,000 acres overnight, as Cal Fire issued a statewide fire update at 8:15 am this morning also saying it has destroyed 7,600 structures. The death toll exceeds the 1933 Griffith Park Fire that killed 29 people in Los Angeles. In an interview, Monday Butte County Sheriff Kory Honea said 13 more bodies were found in Paradise area and three in Concow. Out of the 13 victims, eight were found inside homes and others trying to fend off the flames. The three whose names were released were Jesus “Zeus” Fernandez, 48, of Concow; Carl Wiley, 77, of Magalia; and Ernest Foss, 65, of Paradise. President Trump attacked California officials for “gross mismanagement” of forest in an interview Saturday yet followed his comments with a tweet late Monday that he had approved emergency federal aid for the state. Monday search teams went out to look for more remains throughout the burned area of Paradise, which before the fire had a population of about 27,000 residents and in surrounding hill towns. Many of the bodies had reduced to little more than ash, which required special forensic teams to collect remains and DNA testing to identify the dead. The scene at the Skyway Villa Mobile Home and RV park Monday was filled with handfuls of searchers who spent hours looking through the ashes. Families desperately asking for clues about the whereabouts and well-being of the loved ones they cannot reach. Many took to social media to search for answers. Many stories like these continued to pile in, as more victims are still missing. No one is allowed back into the ruins of the town as of Monday, however, Paradise was busy with activity from PG&E crews checking gas line and dealing with hundreds of downed power lines with scorching lines hanging dangerously above roadsides. The main hospital burned to the ground Thursday and is currently surrounded by installed fences with security guards patrolling the grounds. Authorities from around the state are circling the town for looters and thieves. The Recover is an unbiased substance abuse and mental health news provider. Helping individuals looking for the right treatment programs in their area. Also providing information on California rehab centers for addiction recovery.